No matter how busy the day gets, people still need to eat. We recommend this Quick Chicken Caesar Salad: Ten minutes, six ingredients, four happy diners. 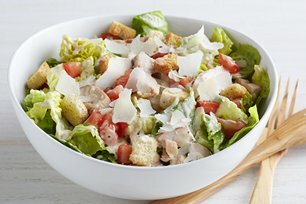 Toss lettuce with chicken, tomatoes and croutons in large bowl. Add dressing just before serving; mix lightly. Serve this salad with a whole wheat roll and piece of fresh fruit for dessert.